The most important part of this stew is the ham hock stew stock base it’s started with. 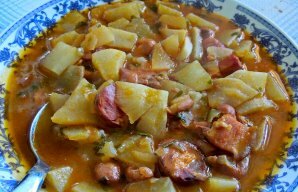 This provides the dish with its “porky”, slightly smoky signature. Begin by placing the 3 ham hocks, 1 bay leaf and the chopped cilantro in the pot, then add the can of chicken stock and just just enough water to cover the ham hocks. Bring to boil, then reduce to simmer for approximately 2-1/2 hours, covered to prevent evaporation. Note that this is a stock-making process, so you don’t put all the ingredients in from the start, as they’ll obviously over-cook and become mush. This will give you time to prepare the uncooked kidney beans. First wash and rinse them in a collander, then place in a pot of water, bring to boil for about 5 minutes, then turn off the heat and let them sit in the heated water for about an hour, check for tenderness (bite-test one), then drain the now ready-to-use beans in the collander. Now you begin throwing everything else into the pot of what you have now is essentially ham hock stock, enhanced by the Bay Leaves and Cilantro. Add the pulled ham hock meat (including the fat if you like it even more decadently tasty! ), kidney beans, chouriço, uncooked macaroni, potatoes, chopped onions, carrots, crushed garlic, the other bay leaf and stewed tomatoes (don’t add the tomato paste yet), then add enough water to cover, and let it simmer for about another hour, stirring occasionally. Finish it by stirring in the tomato paste by spoonfuls until the stew reaches the desired thickness and taste. Some like it more “tomato-ey” than others. Up to you. Adjust with salt and pepper to taste, then ring the bell for dinner and enjoy! 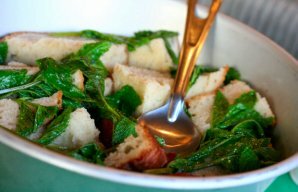 Garnish each bowl with a sprig of Cilantro and serve with your favorite bread and butter. 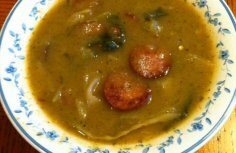 How to make Portuguese green cabbage soup with chouriço. 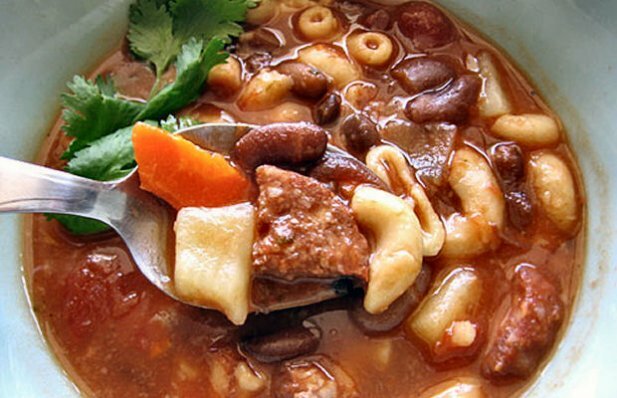 This Portuguese beans with turnip soup recipe (sopa de feijão com nabo) makes a delicious, healthy and quick meal in no time.